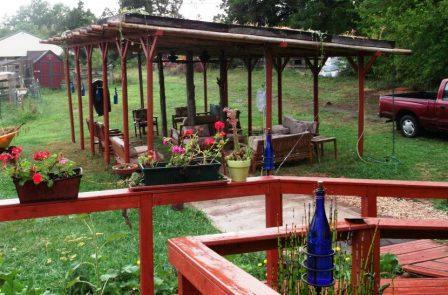 Home » general » From the Folklife Festival to a Virginia farm – Janine & Tim built a gorgeous gazebo! 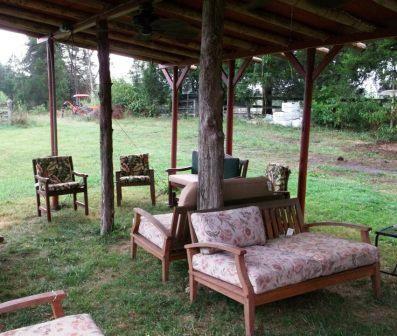 From the Folklife Festival to a Virginia farm – Janine & Tim built a gorgeous gazebo! Being so close to the nation’s capital, we get some really unusual donations! We’ve picked up renovation leftovers from the Interior Department, the Architect of the Capitol, the DC Convention Center, and National Geographic, to name a few. 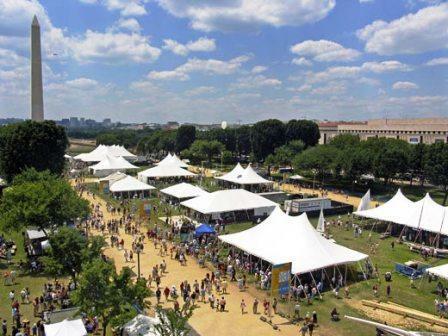 But if we had to pick a favorite institutional donor, it would probably be the Smithsonian Folklife Festival. After the 2008 festival, they offered us huge vinyl banners – which we knew would make excellent heavy-duty tarps! In 2009, stacked-stone fences were used to portray a traditional village in Wales. After the festival closed, we hauled away many tons of stone, which Forklift Fans put to use in landscaping projects around the region. We heard about Community Forklift via Google because we see similar salvage places featured on the DIY and HGTV network, and were wondering if anything near us existed. We are both wildlife biologists who work for the U.S. Fish and Wildlife Service in Arlington, Virginia, and have a general aversion to all things ‘new and modern’ because they use up valuable resources (trees, water and energy) and they look yucky, especially in the beautiful Virginia landscape. “We had just taken a natural building course in Ireland on building houses with cob (clay, sand, straw and water) and learned how to build living roofs there too. We figured we could build a gazebo with a living roof. We had been wanting to build a larger gazebo because we used our $300 10-foot-by-12-foot Home Depot gazebo to death, even going through three canopies (we would live outside if we could, and with as much time as we spend outside in the summer, a shady place to get out of the hot sun, or perhaps enjoy a cold glass of Chardonnay after a hard day’s work is a must). “So we made a day of Community Forklift (it was a 3 hour round trip from our 10-acre farm in Catlett, Virginia) and of course we wanted to buy everything. When we went around back and we saw the bamboo, donated to Community Forklift from the Smithsonian Folk Life Festival (Columbia exhibit), and it was exactly the right circumference from front to back (~4” diameter). OF COURSE we couldn’t bring the bamboo home in our Prius. They were 18′ long, so we came back the next day (another 3 hour round trip) with our truck and our 16′ trailer and brought them home. The stepping stones on the roof are made of recycled tires! “THEN CAME THE MATH. Luckily I have a father who was a civil engineer, and a husband who is a math genius, and we had to work out wet loads and dry loads, so that with the soil and rain and snow, the thing wouldn’t fall down. The mixture for the soil was light (horse manure, vermiculite and sphagnum moss), so that helped with the overall weight of the roof. “Yada yada yada, we got it up. It is 15 feet by 25 feet. Our tool of choice was my father’s four-prong walking cane that allowed me to push the plywood boards up to my husband in order for him to secure them onto the bamboo poles, and I also used it to send up additional wood screws, fallen drill bits, etc. on it’s base. We braced the gazebo on the sides in the back with cables (which we decorated with “bee” medallions at the criss-cross) to address wind sheer, and hoisted a kajillion buckets of roof soil mix onto the roof (we used this excuse to buy a tractor). 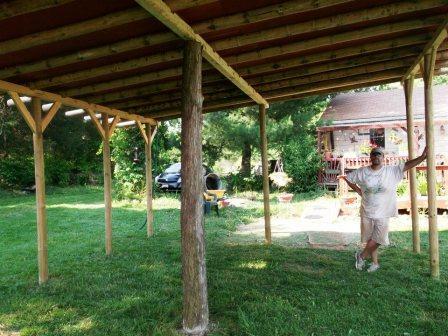 “We noticed some give in the center of the roofline, so we went and chopped down a dying cedar on our property and cut it in half and braced the middle part of the inside of the gazebo with both cedar poles. This enhanced the rustic look. We then planted sedums and hens and chicks, ice plants and dumped several bags of eastern wildflower seeds, and watered the roof. “THEN we made wine bottle tiki torches (got the idea off of the internet), which required drinking 14 bottles of Chateau Morrisette’s “Our Dog Blue” (not all in one sitting of course, but we did “take one for the team” …) and put those up. “Last but not least, we had an electrician come in and wire the place so we could have lighting (I like white fairy lights) and outdoor ceiling fans, and then we put in a misting system. Last, again but not least, we moved our furniture in. “It is still not done. We want to build a cob fireplace (which has outstanding thermodynamic properties) this summer, so we can use it into the fall. And finally, we plan on putting in a cob floor, which will take lots of time, but will be beautiful. It was a great project for only two people to do, and it is so beautiful with bees (which we own) and butterflies (which we do not) flitting about the flowers on the roof on a lovely summer day. “P.S. – It cost us about $5,000 all-told. $1,000 of that was the electric work. It took us about 12 weekends from start to finish (We both work full time). “The suckiest part was hoisting the soil mixture in buckets onto the roof IN THE WIND.